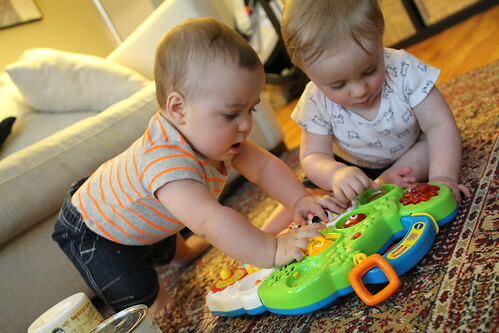 On Tuesday I arrived home from work, after picking up the guys, to quickly need to throw together dinner. Jen wasn't far behind me so I just cooked up some raviolis. A few days ago Jen told me to get some eggs so we could cook them eggs. Jen said that we could only cook the yolks because it was the whites that they could be allergic to and that we shouldn't feed them whole eggs. It was then that I realized they'd been eating whole eggs in the form of pierogies for a couple of weeks now. They seemed to be doing okay so the flood gates were now open! Raviolis were not as big a hit as pierogies but they still went over pretty well. I think they were just a little disappointed that they weren't as messy as some other foods. After another harrowing experience getting them both bathed, and a failed attempt to put them to sleep I opened this Urkontinent from Dogfish Head which I've been sitting on for about nine months or so since was last released. It was very nice. So nice that I finished the bottle in one evening, a rare event for me with a large bottle of beer. Perhaps it was because it was so smooth and didn't really feel like a beer that was 8% ABV. Or perhaps I am just glorying in the growth of my now International Beer Belly. While we attempted to make them sleepy Jen tried her new trick of feeding them pieces of bread which they really enjoy chewing on, poking each other with, throwing on the floor, and sometimes even eating! On Wednesday I had the day off from work and began to tackle the necessary task of rearranging the living room from our previous arrangement. About a year ago we switched over to the new arrangement which divided up the room nicely and looked way better, allowing us to move everything we needed to into the babies' room and surrender our bedroom to them while claiming the smallest, least-desirable room in the apartment for ourselves. The new arrangement, while not looking as good affords the Wombats the room they need to explore as they are now mostly mobile. 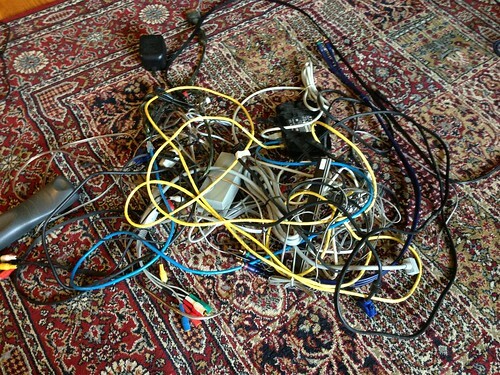 As with any change where the entertainment center needs to be disconnected, moved, and reconnected, it left me with a tremendous number of spare wires. Also, the full 8-plug surge protector is now home to a mere 3 plugs. Even having done this several dozen times in the course of my life it still astonishes me how this happens. Part of this was due to the removal of our giant, 90s style receiver and the Wii which sadly died on us about a year ago. After I set them up in their new, more spacious play area the Bubses quickly got to work dominating their learning farm. I had to remove it from its stand because of Elliott's new found love of trying to climb up it even though it is top heavy and weighs far less than he does. For dinner I started them off with their first taste of grilled Chilean Sea Bass leftover from Monday night's barbecue. They seemed to like it okay but, like humans, not enough to make it worth $27.99 a pound. I love Chilean Sea Bass but not enough to spend $27.99 a pound on it. 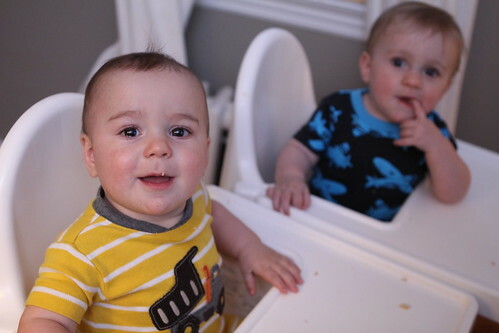 After their bath, which is getting increasingly difficult to administer with just one adult, I managed to get them into diapers in their crib where they enjoyed another in a series of climbing contests. A 24 hour temperature change brought us from lows in the 20s and wearing a hoodie during the day to me spending much of the remaining day installing air conditioners and preparing for highs in the 90s. It was, however, nice to let the guys just sleep in their diapers which will undoubtedly save a tremendous amount of laundry hassle. 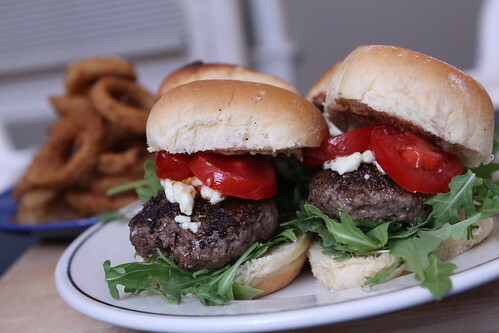 With no time to grill I made some lamb burgers with feta, arugula, Campari tomato, and german mustard. 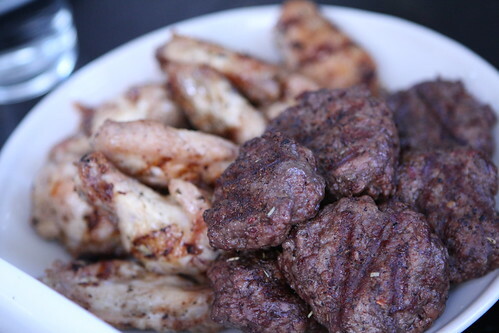 I served them up with onion rings which we were able to mostly enjoy with minimal Bubs interruptions. 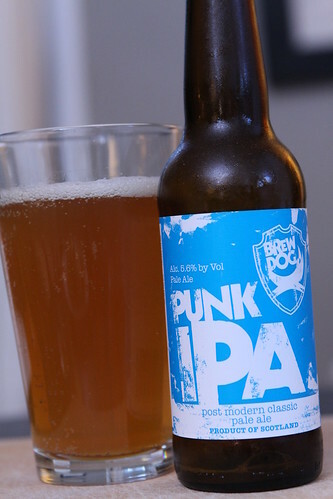 For a refreshing, warm-weather beer we had this Punk IPA from BrewDog. This is fitting considering I often chant "Punks! Punks!" at the babies. Hopefully this will not cause them to grow up with some complex. I've been wanting to try this beer since seeing the brewers on my favorite television program of all time: Oz & James Drink to Britain. While it was about six weeks past its best before date it was still quite enjoyable. 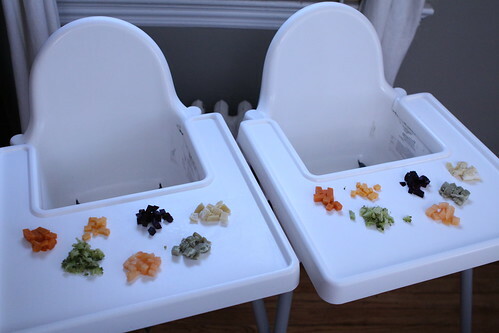 Last night I made a very careful selection of foods for them to serve themselves including beets, cantaloupe, sweet potato, broccoli, cheddar, and two types of ravioli. 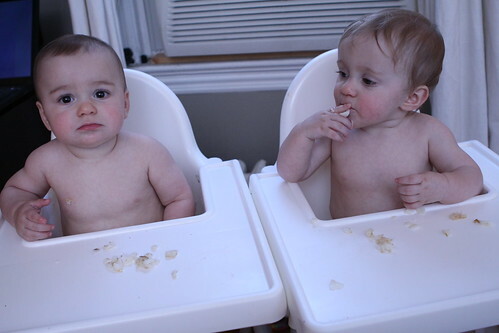 You may think by looking at the above photo that they ate all of the food. The true story is what was on the floor after this feeding. Suffice it to say it was most of everything pictured in the previous shot. After dinner Elliott and I played a few rounds of everyone's favorite children's game: Don't Touch That Computer. The nightly bath time routine is turning into a bit of a chore. 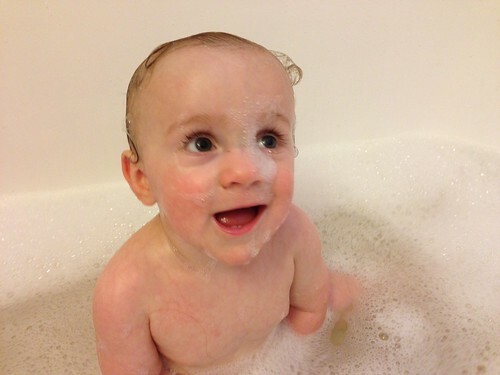 They now get way, way too dirty to do an every-other-day bath like we've done for so long. There are benefits to this as it calms them from their inevitable super-fussy post-dinner period. Martin loves to splash. 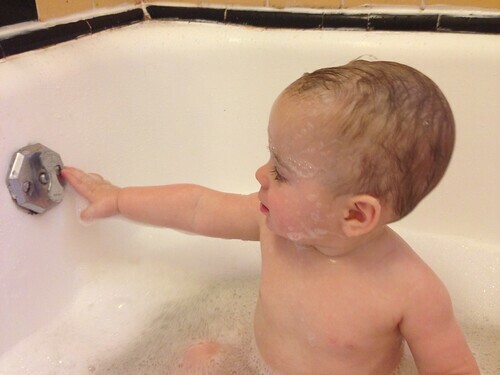 Elliott likes to poke at the drainage lever and occasionally try to climb out of the tub which scares the crap out of his father. After getting them both dried Elliott fell asleep almost immediately. 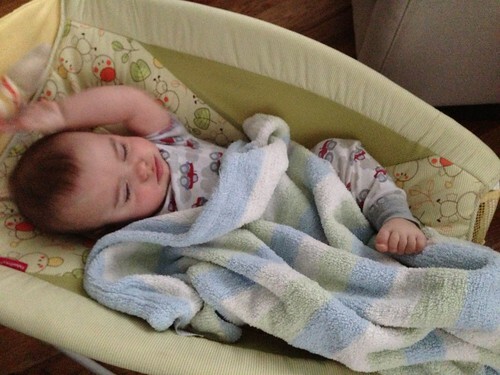 He is so crazy and active during the day that he's generally exhausted lately which has bade bed time a bit easier. 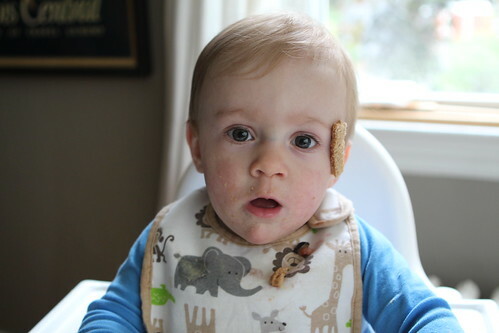 Martin took an unprecedented four-hour nap so we allowed him to stay up and eat bread for a while before putting him to bed. 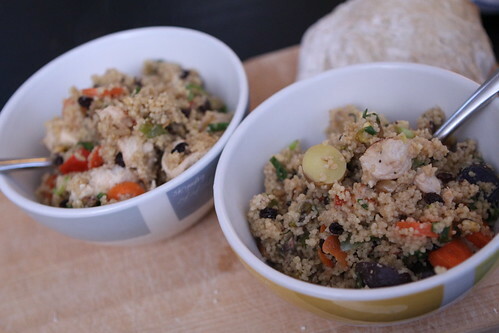 While Jen rocked Martin to sleep I put together this cous cous with leftover peppers, onions, potatoes, carrots, green onion, and chicken breast. 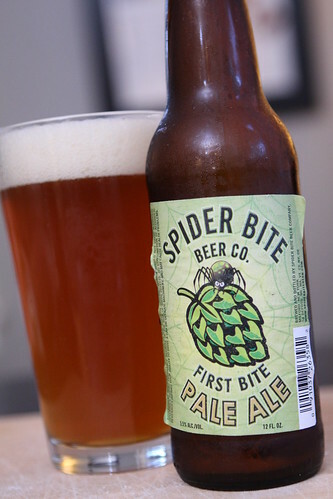 Before turning in at a surprisingly early hour we had this First Bite Pale Ale from Spider Bite Beer Co. This was an exceptionally sour-tasting pale ale but enjoyable nonetheless. Just not what I would have expected from a pale ale. Getting to bed before midnight made waking up to the sound of Bubs chatter at 6:30 AM so much easier. It was one of the better nights of sleep the four of us have had in a while. Not that the babies care since they get to sleep whenever they want, even though they're often too stupid to know that what's making them so angry is that they're tired. There will never be anything quite as unfair as the fact that parents want nothing more than sleep and do not get it while babies can sleep whenever they want and never want to. I was excited to have Sunday off for a visit from my friend, and rock and roll drummer, Scott along with his wife Vanessa and daugter Samara. They had yet to make the Wombats' acquaintance. 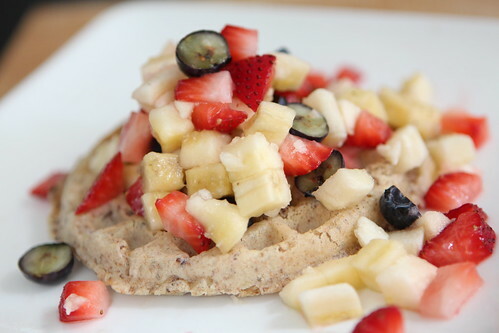 For breakfast we made them their first ever waffles which they seemed to like quite a bit. 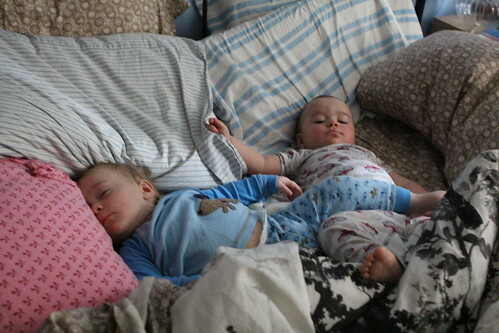 After breakfast they took a quick nap where Elliott did what he normally does and kicked a foot free of the blankets. Apparently my grandfather also liked to sleep with his feet out of the blankets. Perhaps this is hereditary. This wouldn't be so bad except that he so often wants to sleep in bed with us which means we can't sleep with the blankets any higher than our waists. 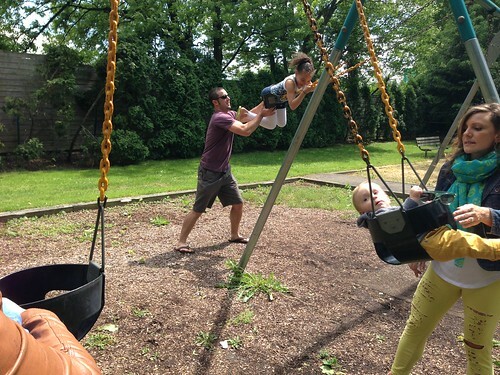 They woke up before lunch and soon after Uncle Scott and Aunt Vanessa arrived with Samara. The guys take a minute to warm up to new people, that is unless the new people have tons of bracelets and anklets on in which case they immediately form a bond. They also get extra points if they feed them. 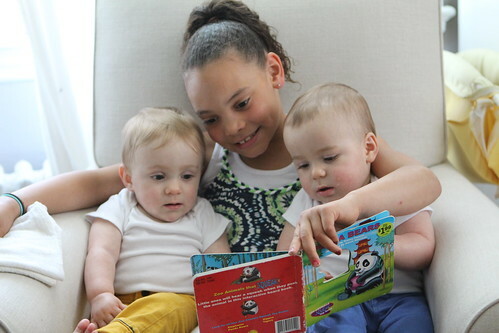 Also popular: reading a book to them. Even if it's the world's most poorly written book about baby panda bears. 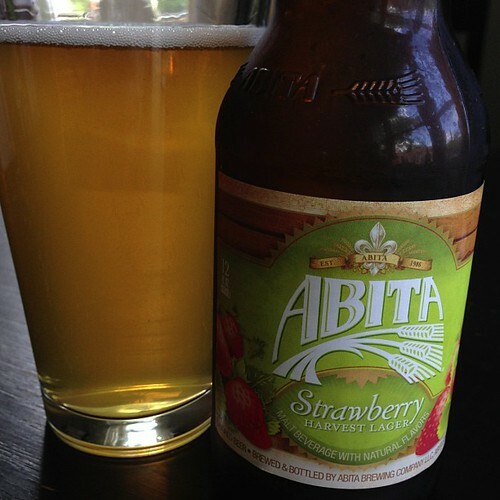 We started off the afternoon with a refreshing Strawberry Lager from Abita Brewing Company. While I generally avoid afternoon beers this was so light and refreshing it was like drinking a lemonade. No afternoon nap was required. 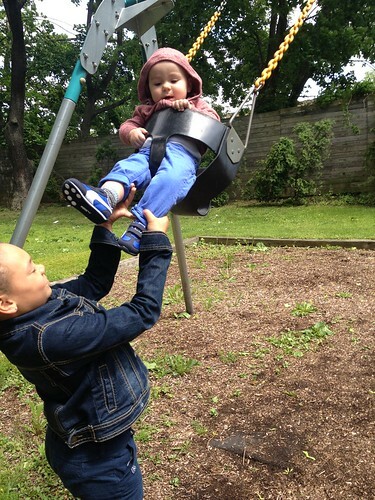 After lunch we went for a walk to the park and enjoyed the Wombats' favorite pastime: swinging. 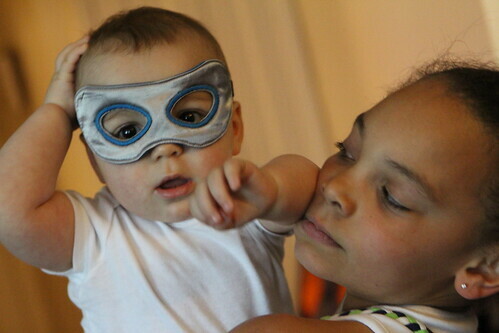 Then Elliott dressed up like a super hero with a little help from Samara. For dinner we made a mini-barbecue for the Wombats with chopped up vegetables, cheese, and shrimp. 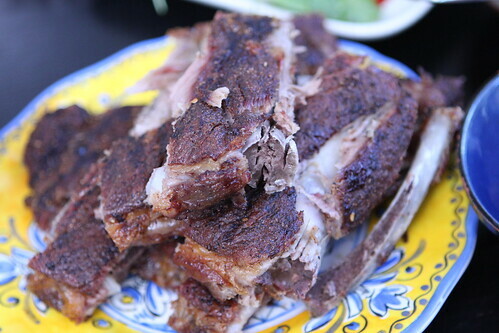 For the 12 month and over crowd we had some slow-cooked St. Louis Ribs . . .
. . . grilled grass-fed sliders and wings . . .
. . . and a creamy mustard and scallion potato salad. 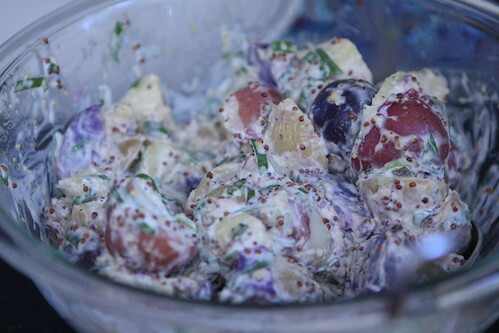 Out of laziness I made this by boiling some potatoes, chopping them, adding mayo, hot sauce, whole grain mustard, and chopped scallions with a dash of cider vinegar with salt and pepper. I didn't add celery or onion and it ended up turning out a little better than I'd thought it would. 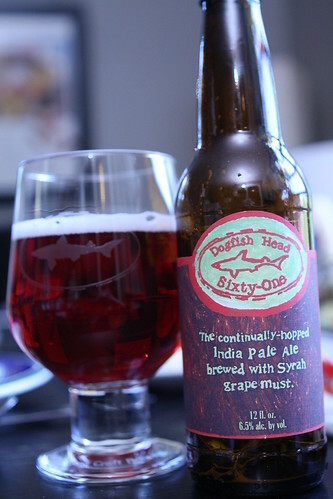 Like any great guests our barbecue invitees brought us great beers that we'd never had before including this Sixty-One from Dogfish Head, a beer I'd been looking for but hadn't had luck finding yet. This is basically their Sixty Minute IPA brewed with grape must giving it the purple color and a nice tartness to it. 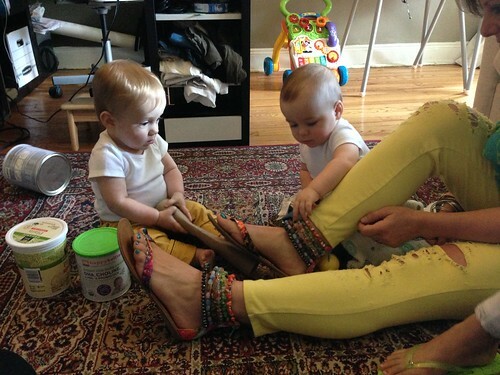 After eating their dinner Vanessa was nice enough to lend about half of her bracelets to Elliott. This may have been the happiest moment of his life. After dinner we all took a walk to the ice cream shop which was inundated with locals. Jen and Samara waited outside with the babies and some woman's dog. We totally could have stolen that dog but, once again, our pesky morals stood in the way of getting a free pet. 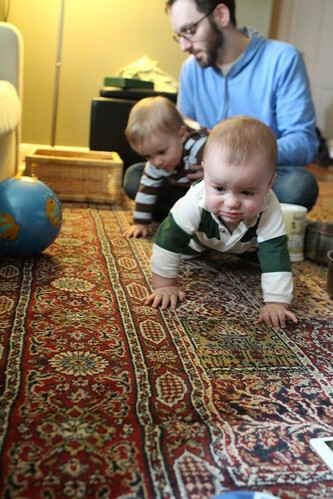 Memorial Day was largely spent in a continued effort to figure out this whole crawling thing. Elliott remains extremely irritable that he is not able to completely figure it out. 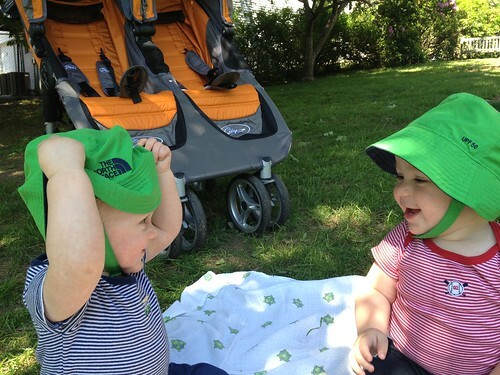 While I was at work Jen took them to the park and put them in hats with straps. This completely foils their continual attempts to remove them and satisfies Jen's urge to keep the sun away from their precious baby skin. When I got home from work I gave both of the guys a free flight in my customer jet fighter simulation. They like landings the best. Lately Martin has been extremely needy to be held by me specifically. 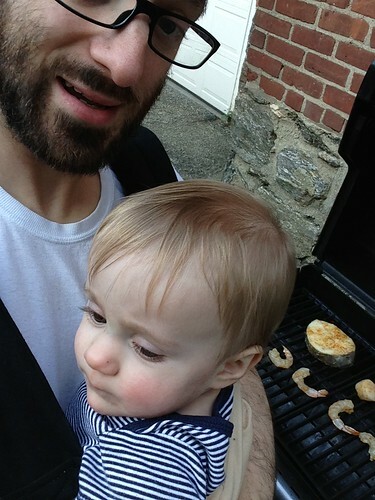 To make things simpler I strapped him to me while we went outside and grilled. Let it be noted that this may have been simpler for him. For me it made grilling sort of a nightmare. Martin came out of it without any burns on his face or arms so I guess it was a success. 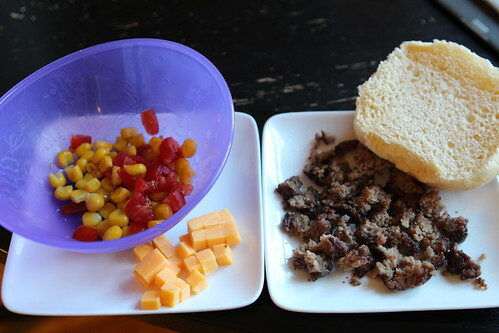 For their dinner we made them a deconstructed barbecue of burgers, cheese, corn on the cob, and tomatoes. 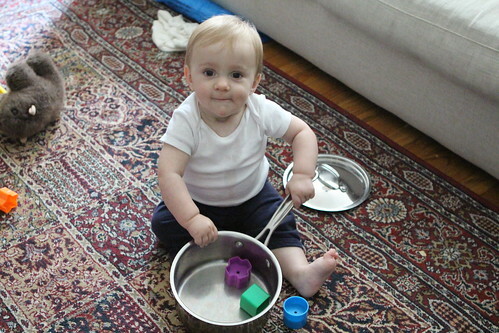 Jen postulated that this was how the whole deconstructed meal craze was born. It makes perfect sense. 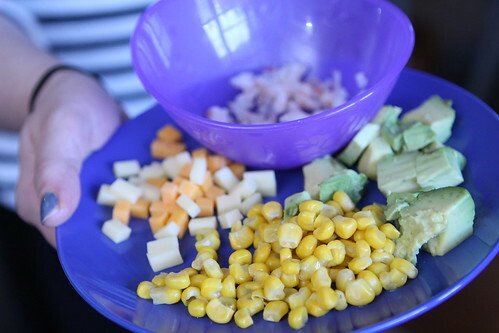 We just chopped up all the things we were having for dinner (or had previously made) and served it to them like this. I guess the real genius of this craze was in figuring out how to then charge huge prices to adults who bought into the trend. 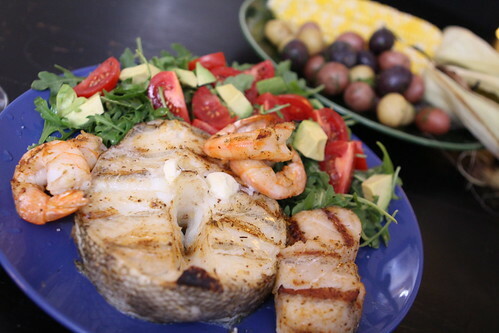 For dinner we had grilled Chilean Sea Bass, shrimp, sea scallops, arugula salad with avocado and Campari tomato, buttered pee wee potatoes with dill, and more grilled corn. The babies did not want to go to sleep after dinner. 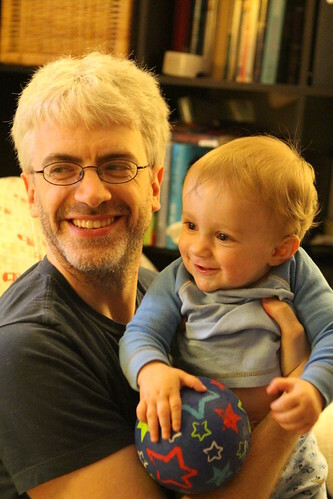 Elliott eventually fell asleep but Martin demanded to stay up. 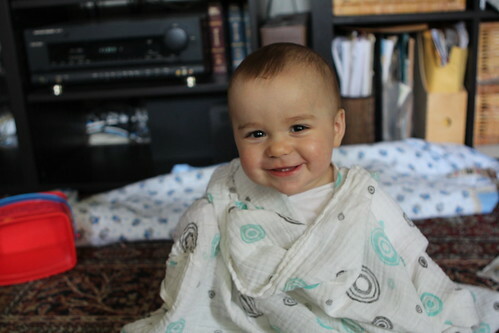 We eventually gave in and set him up in his Rock and Play in front of the TV to watch hockey. He watched for about an hour, mostly quiet, until he drifted off to sleep. Then, at 10:00 PM, the real work began. Dishes, sweeping, wiping down high chairs, taking our showers, getting their food ready for day care, and in bed by midnight. Sadly, this felt like a very relaxing long weekend. All the twin parents we meet in town keep telling us that it gets easier. I think they are liars. Last night I left work and, despite the holiday weekend, managed to make it home in under two hours! 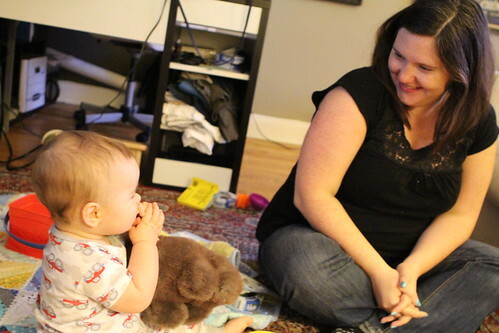 It was an odd feeling to have Jen pick up the guys and meet me at home. Coming straight home after work made me feel like I was forgetting something, namely the two maniacs who were eagerly kicking their feet on the floor in front of me. 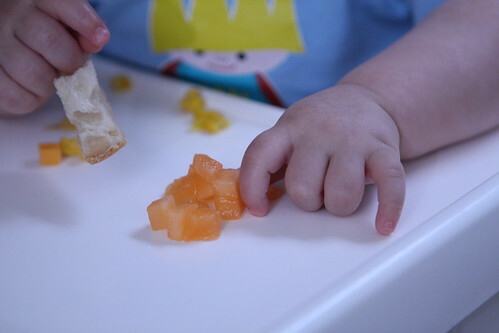 We gave them their first taste of cantaloupe last night. They enjoyed it, though not on the scale of the honeydew we fed them at Jen's parents' house a couple of weeks ago. 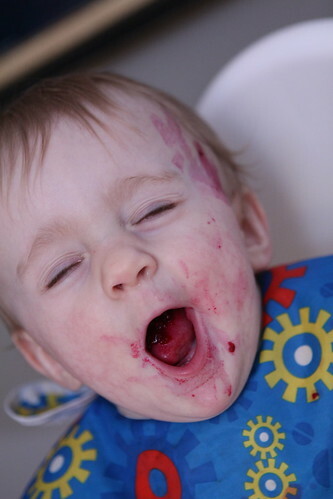 We also gave them their first taste of beets. 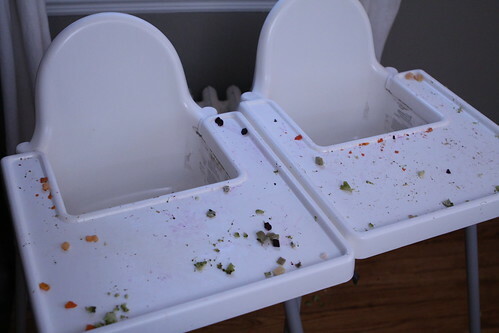 For Martin this was a full body (mostly face) experience, mostly because he enjoyed spreading them out all over his highchair tray then lying the side of his face down on top of them. We have realized now that the dawn of the daily baths is upon us. Uncle Paul and Auntie Caolan came over after dinner and, shockingly, we had one of the smoothest and quickest bedtimes ever. If the guys are going to be on their best behavior when we have company methinks we need to recruit friends to come over for dinner seven days a week from here on out. As we enjoyed a dinner of pizza and roasted cauliflower (an odd combination) we also had these Dry Hopped Pale Ale from Founders Brewing Co. This was a very interesting pale ale, different than I'd been expecting. 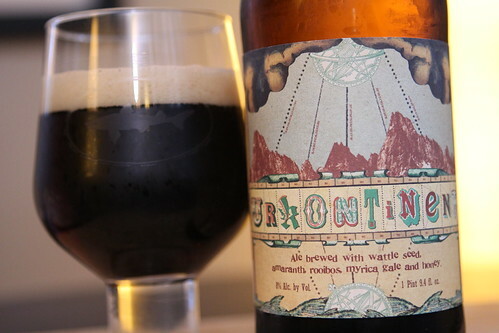 While I'm a huge fan of Founders I've always put this one off because the label, quite frankly, is a little strange and off-putting. I'm just not sure why. 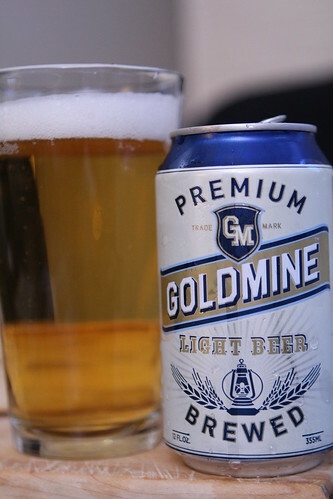 With dinner I also had this Goldmine Light Lager from World Brews which was pretty much what you'd expect from a light beer: bland and devoid of most flavor. This beer comes in at 3.2% ABV. When we went to the Brooklyn Brewery last year they had a beer on tap called Oishi which was 3.8% ABV. The Oishi was extremely flavorful, light, and refreshing. It was fantastic. There is a huge, gaping void in the market right now for good-tasting light beers. I think Brooklyn should jump in and start bottling that stuff. It would be great for them. And, let's face it, it would be great for me. This morning it was freezing cold and rainy, a perfect start to Memorial Day weekend. Because of the dreary weather the guys decided they were going to sleep in. This was especially upsetting to me since I had to get up at 6:00 AM to go to work. As jealous as I was I felt a happiness for Jen who would be able to enjoy a tiny slice of extra sleep. While at work many things happened, including Martin getting some toast stuck to the side of his head. Apparently they did not want to nap simultaneously (always annoying) so Martin gave Jen a cooking clinic while Elliott napped. Elliott showed off his amazing ghost impression while Martin napped. Then they both teamed up to completely destroy a newspaper. 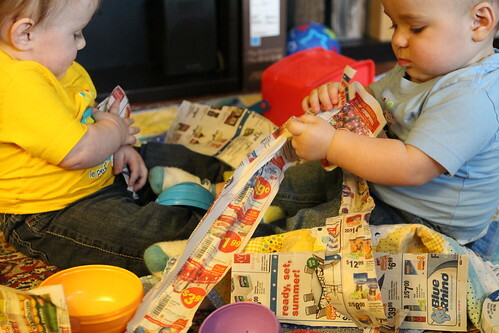 I got home in time to help wrangle them, and to pick out tiny, soggy pieces of newspaper from their mouths. 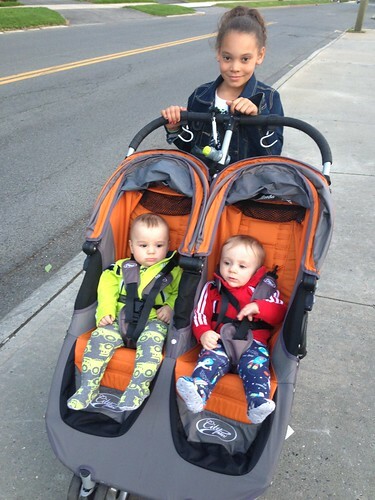 We decided to take them out for a walk despite the cold and rain. Mostly, I think, because Jen got a chance to try out their awesome new shoes. Shoes that will never actually touch the ground. 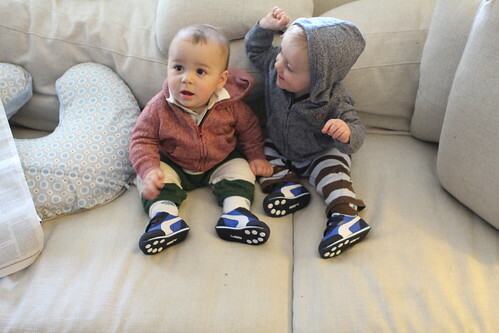 By popular demand, another video of the babies before the walk, fussing, and fighting over the New York Times. No, not an op-ed they read, but possession of the paper itself. 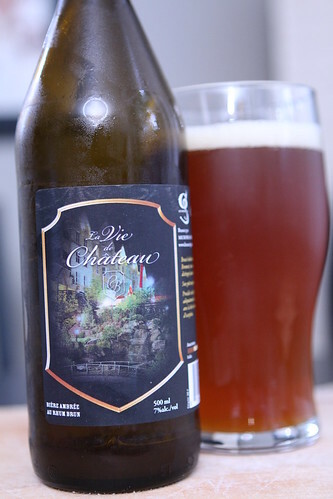 When we got home we had an embarrassing dinner of whatever we could find in the fridge along with this Le Vie de Chateau from /le Grimoire Microbrasserie. This was another from our Quebec trip, an amber beer flavored with dark rum. It was better than the cognac-fortified version but I don't know that I'd go rushing out to try either of them a second time. 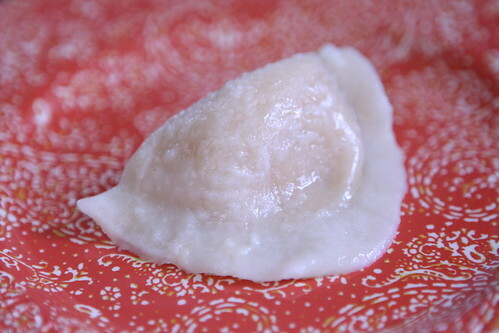 For the second time this week we made pierogies, this time so that we could share them with the Wombats. They loved pierogies, as any right-thinking person would. After dinner we gave them a bath in which Jen sneaked up behind me and tossed something into the tub that started to turn the water bright blue. This scared the crap out of me as I thought that some mysterious chemical had fallen into the tub to eat away at their tender baby flesh. I requested better communication on this practice in the future. 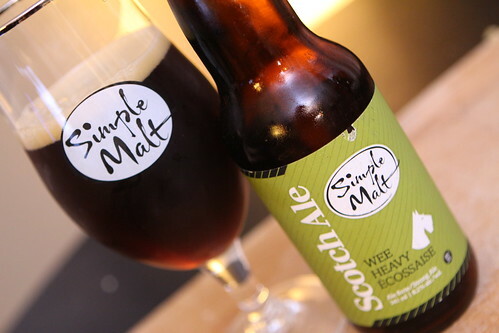 After dinner I settled back with a Simple Malt Scotch Ale from Brasseurs Illimites in Quebec. This was a far superior beer to the previous Quebec brew and a delicious way to cap off the evening, particularly with some dark chocolate. Dark chocolate and a poor-quality feed of playoff hockey. The month of May would not be complete without either.